It was the bright juicy tomato of my garden, suddenly turned red overnight, that reminded me of gazpacho for the summer. There are a million gazpacho recipes it seems and every restaurant has a version. So why is it so hard to get right? Part of the reason is that many cooks think it's just a cold tomato-dominated vegetable soup for summer and don't realize that what a cook aspires to is the harmonic balance of an orchestra of flavors that creates a culturally rooted and important soup. It is a soup from Andalusia and I have a wonderful recipe for gazpacho in my new book THE BEST SOUPS IN THE WORLD due to be published in December 2009 by Wiley. Most gazpachos are, simply, made wrong. Take this photo to the left of a soup called a gazpacho. It is not gazpacho; this is a cold vegetable soup. The garnishes should never play a major role and never be served in the soup; they are garnishes always served on the side and used in miniscule portions. Here's a photo of a true gazpacho; notice the orange and not red color, that's a mark of authenticity. The garnishes are not pictured because they are not the essential condition of a true gazpacho. Nice post. A recipe would be great too, after all, that book is not coming out for quite a while yet and then it will not even be summer! So you are teasing us! 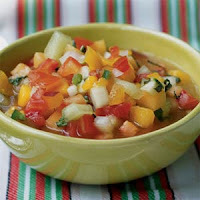 I do know a woman who makes her gazpacho the "wrong" way, I call it soupy salsa. The Anduluisa version is supreme. I like it with crusty croutons and bits of onion and herbs. I have not had the opportunity to have even as a chef the 'right' method of gazpacho, and wonder why that is? Most I have had are pureed, but you still see a texture. Would this mean soups such as asparagus with other ingredients that are more pureed are considered gazpacho too? Like potato leek soup which I put carrots and other vegetables and have served cold, or because the ingredients are steamed it is not? I am going to spain and wonder if you have any restaurants you would recommend?